Are you wondering how to get more out of your Twitter marketing? 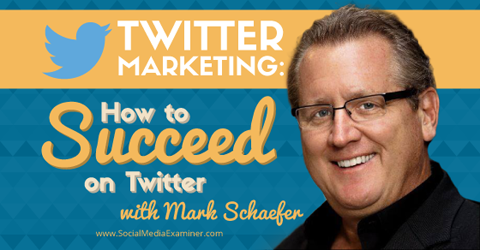 To learn how to successfully market your business using Twitter, I interview Mark Schaefer. 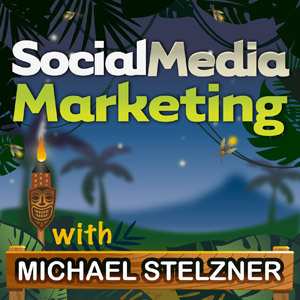 In this episode, I interview Mark Schaefer, the author of The Tao of Twitter, Return on Influence and co-author of Born to Blog. He’s a college educator, blogger, consultant and speaker. This is his third appearance on this show! 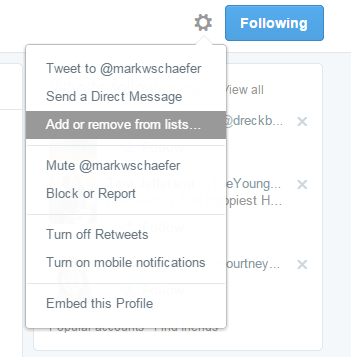 Listen to Mike talk with Mark W. Schaefer to find out how to succeed on Twitter. Mark explores what you need to know about using Twitter for your business. You’ll discover the path to Twitter success, how to utilize everything Twitter has to offer to market your business, and manage your followers and lists. Mark believes that you really need to immerse yourself in the social web in order to truly understand it, or be successful as a consultant or teacher. Mark immersed himself in Twitter 7 years ago, when he started his own consulting business and started to teach. You need to immerse yourself in the social web in order to understand it. Mark admits that he was not an early fan of Twitter. It took him months to figure out that this platform was more than just the advertising, technology, mentions or hashtags. Once he understood the powerful human aspect behind Twitter, it changed his life and he wanted others to understand it too. Mark calls Twitter the greatest networking tool ever created. Many of the connections he’s made around the world would not have been possible without Twitter and his blog. Listen to the show to discover more about Twitter’s powerful ability to connect you with potential clients and opportunities. Mark identifies tao as the Chinese word meaning path. He explains that there is a certain path to success. Behind every Twitter success story, perhaps behind every social media success story, there are 3 essential elements to this path: meaningful content, a targeted audience, and authentic helpfulness. You’ll hear Mark discuss each of these three elements in detail and how they work to create meaningful connections for your business when you use Twitter. According to Mark, there is no better way across any social media platform to create an audience than Twitter. It offers so many ways to find the right people for your business. Listen to the show to discover how these three elements work together to lead to success on Twitter. 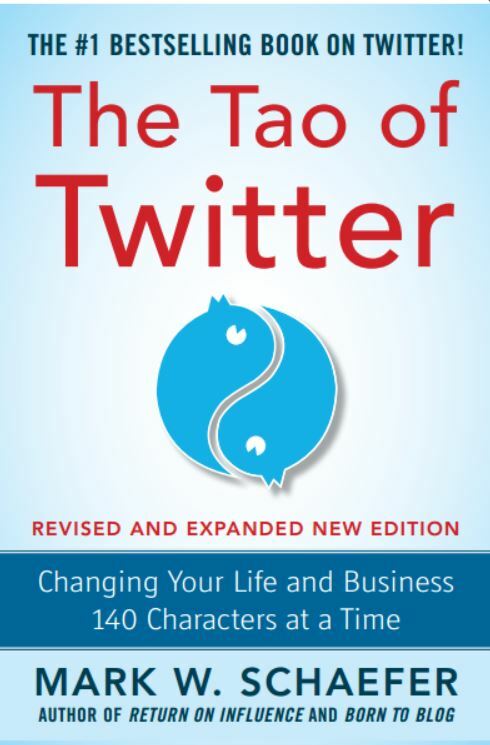 In The Tao of Twitter, there is a chapter called “25 Ideas to Toast Your Competition”. Mark offers a few examples of this in the show. He thinks that Twitter is under utilized by businesses today, yet it has the power to transform your business. For instance, Twitter search can be the most powerful source of marketing research available to you. It offers users the ability to target an audience down to a specific zip code, sentiment, or keyword. Twitter’s Advanced Search allows you to find potential clients, conduct competitive research, track trends, or provide customer service, all in real-time. You can gain so much information from Advanced Search. Mark explores the benefits of paid promotions and ads on Twitter. According to Mark, this is a great time to try Twitter advertising. The inventory is high and the cost is relatively inexpensive at the moment, but Mark projects that this may not be case for long, as more people learn to leverage this opportunity. Listen to the show to discover a little known trick that makes Twitter advertising especially attractive to marketers. Some businesses approach Twitter with a broadcast mentality, while others adopt a more helpful, service approach. For Mark, the beauty of the social web is that there are no cookie cutter solutions. There are lots of different strategies. What works for a large, reputable corporation probably will not work for a small business that wants to build relationships. If you are out there being kind and helpful, people will be attracted to that. If others are doing nothing but broadcasting and creating noise, you can get rid of them. We have the ability to create our own experiences online. The key is to find the right way to support your business online. Listen to the show to hear Mark describe a business case for both the broadcast and the service approach to Twitter. 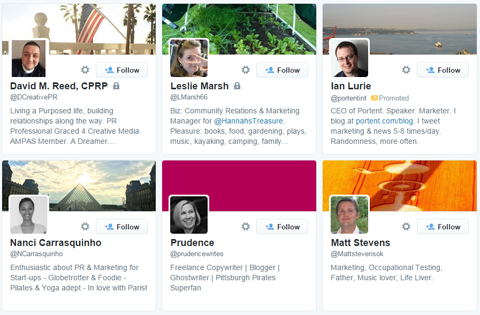 As your business grows, it may be a challenge to follow back every person who follows you on Twitter. Mark’s personal philosophy on Twitter is that it is a valuable networking tool, so he gives everyone the opportunity to follow him. If you are a real person who makes an authentic attempt to connect, then he is delighted to follow you back. Follow back people who are make an authentic attempt to connect with you. This has been Mark’s follower strategy since he started on Twitter, but he’s augmented his approach as his number of new follower per week has increased. However, his interactions on Twitter remains just him. He promises that there will be no other way around that. Listen to the show to find out how many new followers Mark draws per week and what he does to manage it. With close to 100,000 followers on Twitter right now, Mark credits his Twitter lists with helping him make sense of it all. You can create lists by categories (friends, blog readers, customers, colleagues, etc. ), and turn what seems like a wall of noise into an organized way of seeing what people are saying. Twitter lists lets you see what people are saying in an organized way. You’ll hear Mark explain the creative ways that you can use Twitter lists in your marketing and competitive research, and in particular when it comes to influence marketing. 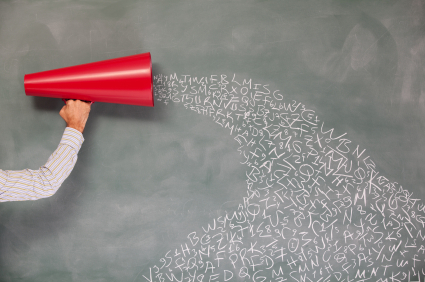 Twitter lists can be a power tool to determine if someone is truly influential on the web. You just have to know where to look. Mark also offers a quick overview of his favorite tools for easily and effectively managing you Twitter accounts as well as other social media platforms. Listen to the show to learn how Twitter lists can help you figure out who to pay attention to on Twitter. Are you looking for a quick way to discover and share great content with your audience? Is finding great content to share a challenge for you? Have you heard about Daily by Buffer? Daily is a free iOS app and it’s brought to you by Buffer, the popular social media scheduling and management tool. Buffer pulls content from a number of sources, including all of your social networks. With the help of their analytics, a team personally hand-picks the best content suggestions and delivers them directly to you through this app. Daily by Buffer is a simple way to discover and share great content. As the headlines and links are being served to your device, you have the option to quickly swipe wipe right for content you like or left for what you don’t. 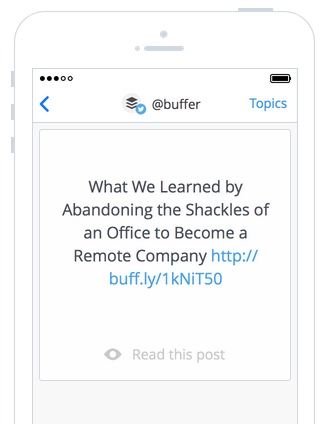 Daily then stores the content you like to your Buffer account, so you can read and share it with your audience later. Fresh content is being generated, curated and delivered every day. By default, Daily presents everything it’s curated to you, but you have the option to refine your search based on your specific interests or topics. The categories currently offered are Marketing, Inspiration, Lifehacking, Entrepreneurship, and Design. Daily also offers a “Best Of” category that pulls its top five suggestions of the day across all topics. Listen to the show to learn more and let us know how Daily by Buffer works for you. See what attendees experienced at our 2014 conference. The event takes place in sunny San Diego, California on March 25, 26 and 27, 2015. Hundreds of people have already secured their tickets. The opening-night networking is aboard an aircraft carrier, the USS Midway, and it will be phenomenal. Here are some of awesome presenters you will get to meet in person: Guy Kawasaki, Mari Smith, Chris Brogan, Jay Baer, Ann Handley, Michael Hyatt, Laura Fitton, Cliff Ravenscraft, Joe Pulizzi, Nichole Kelly, Ted Rubin, Mark Schaefer, Chalene Johnson, Darren Rowse, Kim Garst, Martin Shervington, Marcus Sheridan, Gini Dietrich, Pat Flynn, John Janstch, Andrea Vahl, Brian Clark, and more. The list is massive. We have the best sale going on right now. Click here to check out all of the speakers, the agenda and to grab your tickets. Connect with Mark Schaefer on Businesses Grow. Check out his books: The Tao of Twitter, Return on Influence and Born to Blog. Read the Wall Street Journal’s article: Twitter Learns from Facebook by Revamping its Advertising Fees. 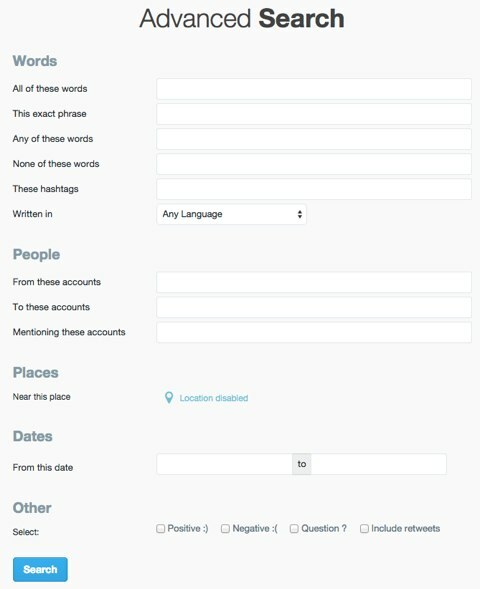 Try Hootsuite Pro or TweetDeck by Twitter for managing your social media platforms in one place. Check out Daily by Buffer. What do you think? What are your thoughts on how to succeed on Twitter? Please leave your comments below.